We are installing analog cameras but as the owner wants to "future proof" the cable when he changes his mind into IP camera so we use CAT6 cables and adding passive video baluns to incorporate the analog cameras. 1. Will the analog signal from the camera clear and strong enough using CAT6 and length of cable is around 120 meters, using passive video baluns at both camera and DVR ends? 2. When using CAT5 cable + passive video balun (cable length about 50 meters), I found the video signal is too weak so I had to combined 4 wires (solid ones together for the + of video) then it works. Under this exact same cable when adding 12 volts power into the CAT5 the video signal is gone. What's going on that I did wrong? 3. Can the DC power also put into the CAT6 while the video will be transmitted along within the same CAT6 cable? 1. Depends on the balun, good ones (e.g Muxlab) specify the exact distance limits. For 120m you will probably need active baluns. The only way to do this is to read the specs of your baluns and also to do a test on your own to make sure it works. 2. Not sure I understand this correct? Did you use the other 4 cores for power? 3. Yes some baluns support both video and power but you can probably do this also with video only baluns if you know the cores being used. P.S. For 120m it might be better to go with 24V AC power, check the consumption on your cameras, are they IR ones? You have to do the calculations about the volatage drop - if you will pass the power through the balun, again read the specs and test. 1. We are in SE Asia and importing stuff from the USA is more expensive and time consuming, do you have other reference nearer to us other than muxlab? 2. Originally I used only one pair to transmit video, but that failed for 50 meters. This was tested using very short cable to make sure the passive balun actually worked. Then adding on by combining 2 pair still not clear video picture, 3 pairs also similarly not clear but getting better, so we finally use all 4 pair just for video transmitting by CAT5 cable. When adding the power was actually done with just 2 pair for 50 meters, so we used total of 4 smaller cables to transmit video while using one pair for DC power within the same cable then pooff the video is gone! We can detect the voltage at 50 meter end of the camera still measuring 12 volts more or less not a significant drop but the video is gone. 3. Could you elaborate more about knowing which cores being used? were you referring to the tightly twisted blue & blue/white for video and other colors for DC power? We are planning to test for voltage drop and if the camera can still work with such voltage later on this week/early next week. We also been considering the 24V AC, that will be an entirely different system, will still be able to use CAT6 cable for video AND 24V AC power without interference? 1. You do NOT need active baluns for a mere 120m. Even cheap passives should be good to 200-300m. Either way, beyond 100m, you're pushing the limits for ethernet, so if you want to upgrade those cameras to IP later, you *may* need some sort of extenders or twisted-pair adapters (or maybe not, I have heard of ethernet working at that range, although it's beyond spec). 2. If you lost signal after 50m, there's something else wrong. FIRST AND FOREMOST, you want to use ONE PAIR for video, period. Mixing-and-matching pairs will result in a loss of each pair's noise-rejection properties, and you'll end up being much more susceptible to interference. It sounds like you may have used some sort of cheap UTP-to-BNC adapters that are flooding eBay lately, masquerading as baluns, although they aren't. Big names like MuxLab and NVT are fine, but stupid expensive; a balun is a pretty simple device and I've had just as much success with low-cost units... just make sure they ARE actually baluns. As far as power goes, yes you can use the remaining pairs, but how far you can go will depend on the voltage used (12VDC vs. 24VAC), and the current draw of the camera. On one site, I have two CNB domes running 200' on a single Cat5e - one pair for video, one pair for power for each camera. They draw only 2.2W, or 180mA at 12VDC, and will operate any anything between about 10-30V, so the minimal voltage drop still leaves sufficient power for the camera. Critical to this is the fact that they don't have heaters or IR - IR will typically add 500mA or more to a camera's current requirements. With Cat5e, three 24ga. pairs together is about equivalent to one pair of 18ga., as far as current capacity and voltage loss... with Cat6 it should be a little closer to 16ga. If the camera will run on 24VAC, you should have no problem powering it at 120m. I've always found this calculator particularly helpful. 3. It shouldn't matter which pair is used for video. I've typically used the blue pair, chosen mainly as the center pair of an RJ45 connector, so I could even use a basic two-wire phone cord to extend it if need be. However, we've recently been using these power/balun units with much success, and they put the video on pair 1 (pins 1 and 2 - orange if you wire T-568B). At the camera end, we'll either use these all-in-one baluns, or if something small is needed (such as to fit inside a dome housing), we'll use something like this on the video pair, and just wire the power pair in directly. Remember that there's nothing special or magical about a power-and-video balun - internally, two pins of the RJ45 jack go into the balun, and the others wire straight through to the power connectors. Same applies to the VPS units above. 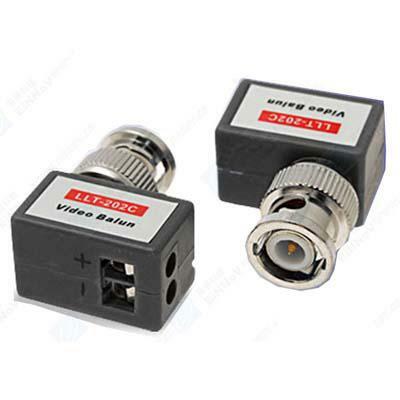 In addition to the balun function, each group of four video pairs goes to another RJ45 jack, so you can take those four cameras and run them to another location over a single UTP cable, then split them out there with another VPS, or with a simple multi-channel balun unit. In the case of that last item, I did exactly that on a recent job: one 16-channel VPS in a remote wiring closet; four Cat5e linking patchbays there and in the main IT closet; another set of patchbays linking the wall rack with the rolling rack containing the DVRs; and a the 16-channel passive balun in the back of the rolling rack. So each camera has a Cat5e run that patches into a channel of the VPS, each group of four is then fed from the VPS, through the patches, down to the passive balun, and the "tails" from the DVR connectors then hook straight into the BNC outputs on the balun using these, and a couple of these where I need to split off an analog signal. It's working GREAT, and a benefit of terminating everything in a patchbay means that switching an analog camera to IP means simply unplugging the camera, moving the patch from the VPS to a PoE switch, and plugging in the new camera (which I've already done once on this site). Re: 24VAC power: there is no problem using it with baluns. The voltage and current are low enough so as not to generate significant interference in the first place, and the unique twisted pairs used in Cat5/6 means each pair has its own noise-rejection properties anyway. If distance and power requirements call for it, have no fear in using it. Oh, one other quick thing on distance: I did some testing of various passive baluns a while back, using a range of models carried by our local ADI, from some that were $5/pair to some NVTs that were $40 *each*, and found little or no difference in the image quality of each. The camera was powered directly, but the signal itself went through a nearly-full box of Cat5e... probably about 800' left of a 1000' box. Matt thanks for the great details, I noticed from your descriptions that I might be dealing with some bad video balun as I obtained them locally here and most probably made in China from some unknown manufacturer, this is the case with the analog industry here where the really product that works usuallly cannot be bough locally because too expensive for the local users' pocket.... talking about low-end users here! Also good suggestions for the less clutter arrangement, that preps us for the other installation. We are gonna have another go at it based on your suggestions. Heng, these are the types of units I'm referring to. It's the first hit that came up when I searched "cctv balun" on eBay. You'll notice the title just calls them connectors, but further down they're described as "balun connectors".  I've seen these pop up on other forums, people having all sorts of problems with them, because THEY ARE NOT BALUNS. If these are what you're using, that's your problem right there. One other thing I've run into, were cheap baluns (real baluns) that do actually work, but the polarity is labelled wrong, so when connected as marked, they show a broken or scrambled picture, or don't work at all. If you have real baluns but don't get a clear picture, try reversing the wires on one of them.